I am 77 years old and I live a village which is several miles beyond the Milton Keynes boundary. My paternal family came from Stoke Hammond and Drayton Parslow which is not far from Milton Keynes.. Looking back I regret that I did not ask my parents more questions about their lives while I had the chance. One puzzle, for example, is why my father, the youngest of eleven children, who lived in Ashton started school at Roade when he was three. Why, I now wonder, did he and his siblings, walk nearly two miles across the fields to Roade instead of going to Ashton village school. Was this because my paternal grandmother, a staunch Baptist, would not allow her children to be educated at Ashton which was a Church of England School? Perhaps there was some other reason. Another thing, my mother told me many times that she and my father had married in a Register Office but she did not expand on this. As a ten year old I thought “so what” and did not appreciate why this was such a big thing. My maternal grandfather was the Vicar at Roade so it seems odd that my parents had a civil wedding in London instead of marrying in the Church which had featured so prominently in my mother’s life. When I was about sixteen an aunt told me that my parents had eloped. Why, why, why I wonder did I not then ask my mother to fill in more details. Apparently the Register Office wedding was arranged to take place while my mother’s parents were visiting her family in Chard. When the deed was done my parents sent a telegram to Chard with the message that they had married. Uncle Arthur, my mother’s brother, told me many years later and after my mother’s death that he had been sent to London to bring her back. I don’t know why there was such opposition to the marriage but I think the most likely reason was a sort of snobbery. My mother had had a privileged upbringing. 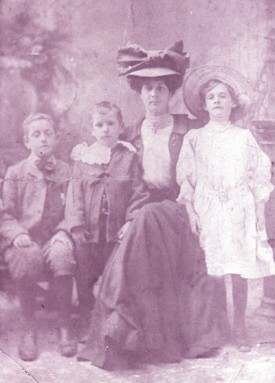 The 1911 census shows that the Sharland children had a governess and other live in staff and perhaps they did not want their daughter involved with a large working class family of eleven children whose father worked on the railway. My parents married in 1931. Life was hard for them and money was short. My brother born the following year needed special formula milk. This, together with the high rent for their railway cottage, accounted for most of my father’s wage. To make ends meet, my mother earned money “charring” A term not often used nowadays but she rolled up her sleeves and found work as a cleaner. I am very proud of them both. They were in the same position as so many working class families in the thirties. The situation changed after the start of WW2 My father continued to live and work in London but my mother, brother and I came back ”home” to Roade. One morning, going back home after his night shift, shunting at Willesden junction, my father turned the corner and our house was not there, just piles of rubble in its place. How fortunate that he was at work and we were safe in Roade when the bombs dropped. The target was probably Willesden junction railway lines which were only yards from our terraced railway home. As a child I knew that three of my father’s brothers had emigrated to Canada and that one of them was killed serving in the First World War. However, I just knew the bare facts. My father did not talk about what life was like when he was a lad. I wonder whether he was envious when his elder brothers went off one by one to a new life in Canada. What an adventure it must have been to leave their rural surroundings and sail off to try their luck in Canada. My father rarely talked about his life in depth and I was too young to appreciate the impact these events must have had on the family. Two of the brothers in Canada signed up with the “Canadian Over-seas Expeditionary Force”. 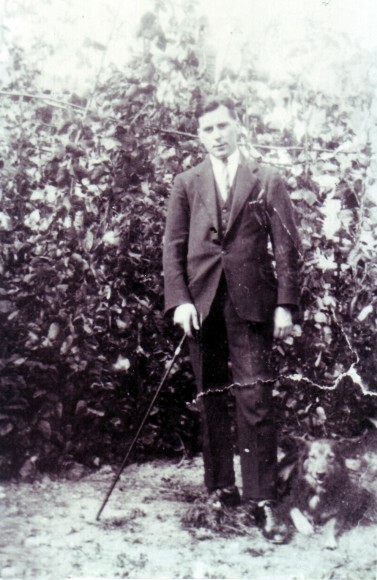 The elder, Joe, was killed a few weeks after landing in Flanders. He died on April 22nd1915 in the front lines by the Belgium city on Ypres. 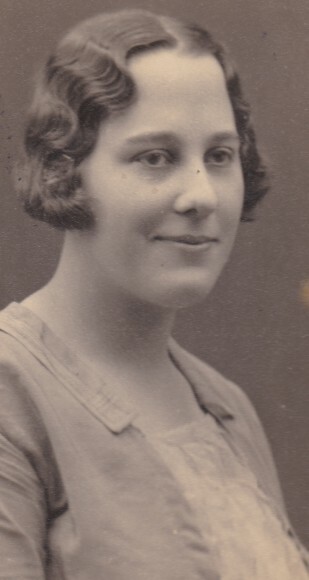 In a photograph of my grandmother she is wearing a pendant. The picture on the pendant is of a young man. I will never know for sure whether it is a picture of Joe but I feel certain that it is. There is a photograph of my grandparents and their four eldest children which was taken about five years after they married. 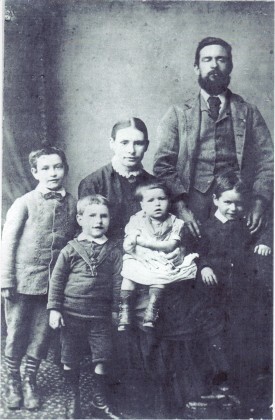 They are neatly clothed and “booted” but the picture is typical of a working class family. Later pictures show them in very grand clothes. Were these, I wonder, “hand me downs” from their daughter Beatrice’s employers. 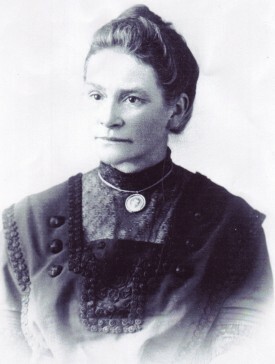 Beatrice worked away from home “in service”. Otherwise, were garments kept at the photographic studio so that people could dress up for the occasion? On the other hand maybe my family’s fortune changed dramatically. It is possible that my grandfather’s change of employment from agricultural worker, to shoemaker and finally as a ganger on the LMWR (railway) was the source of their apparent affluence. To me, as a child of ten, I thought the First World War was years and years ago. I could not understand why people talked about it and I just “turned off”. I wanted to play, or get on with today not talk about things so far in the past. Now I realise that the war had ended only 25years earlier. I was obviously not mature enough to ask questions and no one explained to me what life must have been like years before. 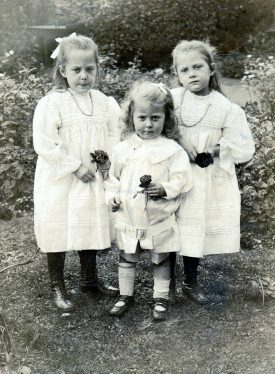 I can remember both of my grandmothers and my vicar grandfather but they did not tell me about their early lives. If only it was possible to sit down with them all now and have that chat. On reflection, perhaps I’d better start talking to my grandchildren as soon as I can so that they don’t have similar regrets in fifty years time.